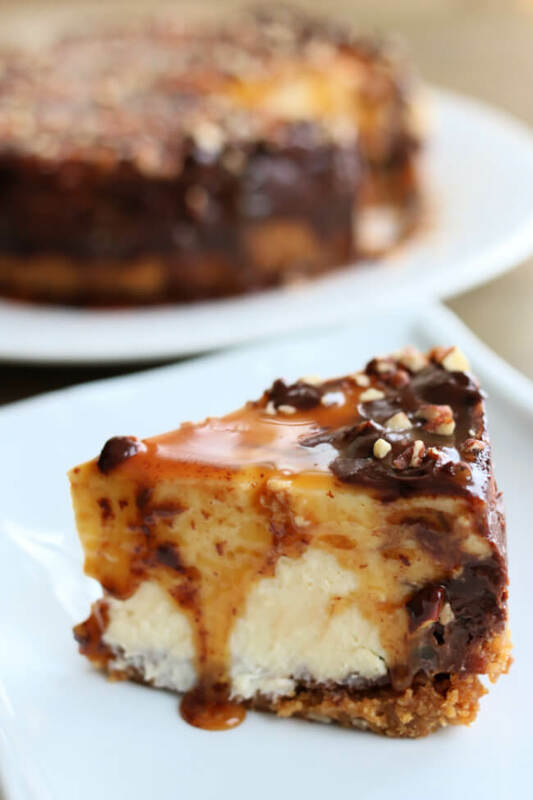 Pressure Cooker Turtle Cheesecake is a decadent cheesecake made with a graham cracker crust and plenty of pecans, caramel and chocolate. 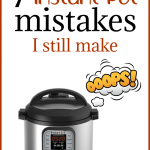 It’s baked in your electric pressure cooker to ensure consistent results every time. OXO partnered with me on this post. Today I’m going to be sharing with you how to make a cheesecake in your pressure cooker. This turtle cheesecake is the perfect dessert for a special occasion (such as Valentine’s Day). It’s creamy and rich and decadent. 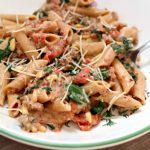 If you’re new to the pressure cooker or haven’t made a pot-in-pot recipe yet I’ll walk you through it. For this recipe you don’t put the cheesecake directly in the pressure cooker. We use the pot-in-pot method which just means you’re cooking your food in a dish inside the pressure cooker liner instead of cooking the food directly in the liner. First you add a cup of water to the pot and then lower a 7-inch springform pan into the pressure cooker with a sling. The moist air around the cheesecake cooks it in minutes with no cracks in the top of the cake! 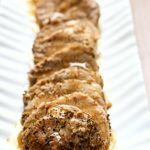 I was so excited to try out my OXO Silicone Pressure Cooker Sling for this recipe. I’ve used homemade foil slings before, and they were always a little clumsy. This OXO Silicone Sling is perfect because it helps you to easily lower bakeware in and to lift bakeware out of the pressure cooker. 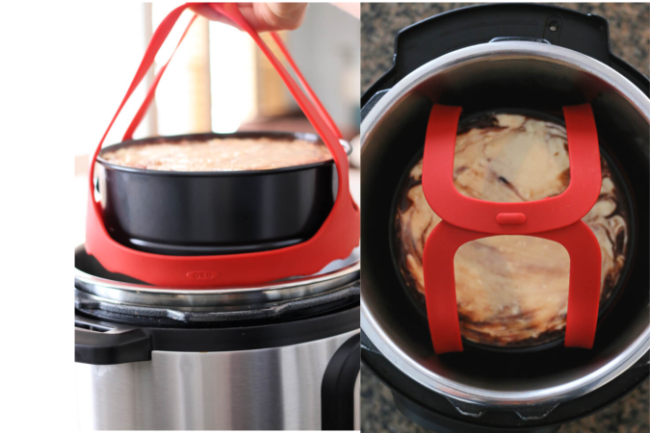 The sling also elevates the bakeware off the bottom of the pressure cooker and can be used as trivet as well! If you love cooking in your pressure cooker, I highly suggest the OXO line of pressure cooker accessories. They are all made of silicone (heat resistant) and are specifically made with the 6 or 8 quart electric pressure cooker in mind. The Silicone Pressure Cooker Egg Rack lets you cook 9 eggs at a time while holding the eggs steady. The Silicone Pressure Cooker Rack elevates food while cooking which is handy when making meat in the pressure cooker. 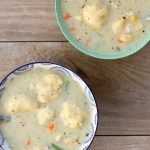 The Silicone Pressure Cooker Steamer is handy for lifting vegetables out of the pressure cooker. I love how all these accessories are so easy to clean and they all are dishwasher safe. Because if they weren’t, I wouldn’t be using them…let’s be honest! Now let’s talk about this cheesecake! If you’ve never made cheesecake before it can be a little tricky. You have to make a crust and make sure the batter isn’t overmixed or else it will be like a soufflé and try to bake it without it cracking… But, don’t get overwhelmed. 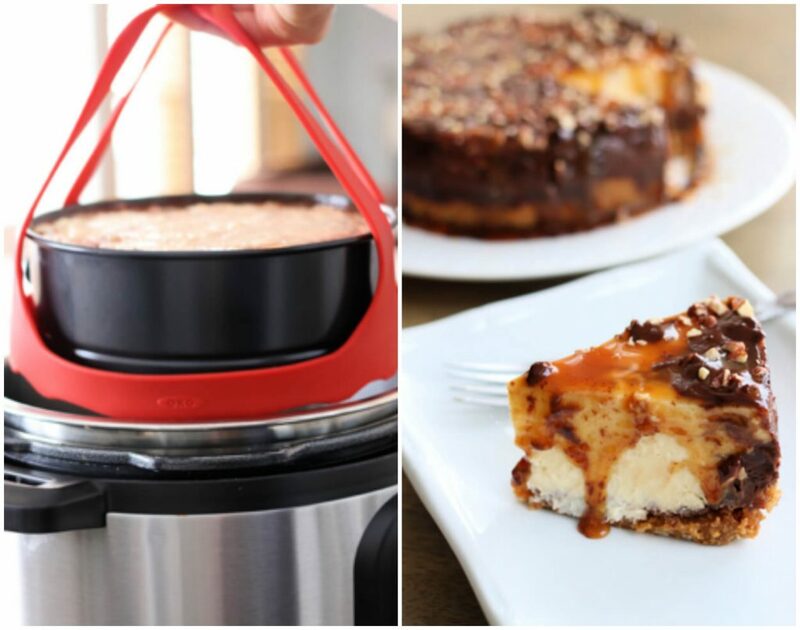 A perfect cheesecake is possible, especially with the help of your pressure cooker. Tip #1: Use a hand mixer instead of a powerful stand mixer. This will allow you to mix on a lower speed. This way you won’t overmix and add to much air into the batter. When there is too much air in the batter it becomes puffy—like a soufflé! Tip #2: Your cream cheese, eggs and sour cream need to be at room temperature. So, get them out early and lay them on the counter. If these ingredients aren’t at room temperature, you’ll get a lumpy cheesecake. Tip #3: Once your batter is in the pan tap the pan up and down on the counter a few times. This will let all the air bubbles come to the surface and then you can pop them with a toothpick. Tip #4: Let the cheesecake refrigerate overnight for a set and firm cheesecake. But before you place it in the refrigerator let it sit on the OXO Silicone Sling on the counter top to cool the cake completely to room temperature. If a warm cheesecake is rushed into the refrigerator, the cake will contract dramatically, causing cracks. Refrigerate at least 8 hour and up to 24 hours before serving. 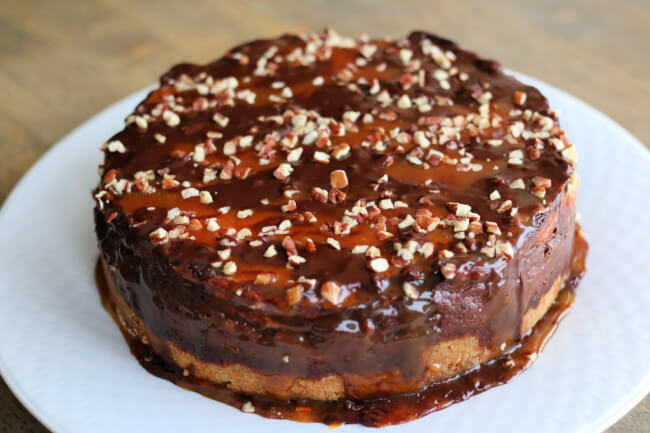 A decadent cheesecake made with a graham cracker crust and plenty of pecans, caramel and chocolate. 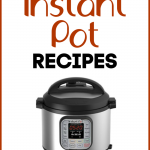 It’s baked in your electric pressure cooker to ensure consistent results every time. Get out ingredients: Place your cream cheese, eggs and sour cream on the counter to come to room temperature. Heat your oven to 325º F.
Use a food processor or a blender to grind your graham crackers to crumbs. In a small bowl use a fork to combine the graham crackers crumbs, melted butter, pinch of salt, brown sugar, flour and pecans. Line the bottom of a 7 inch with parchment paper. I used a pencil to trace the bottom of the pan on the parchment paper. Then I used scissors to cut out the paper. Then I placed the parchment paper circle in the bottom of my pan. Pour the graham cracker mixture into the bottom of the prepared pan. Press the crumbs down with the bottom of a small glass. Form an even layer of pressed down crumbs. Use the back of a spoon to press the edges of the crust into the side of the pan. Place the crust in your oven for 15 minutes. Put the chocolate chips in a bowl. Heat the heavy cream just until it begins to boil, then pour over the chocolate chips. Allow to sit for 2-3 minutes and then whisk the mixture until smooth. 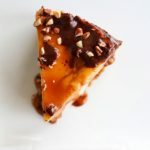 Pour the 1/3 cup of caramel sauce into the bottom of the baked crust and then sprinkle 3 Tbsp of chopped pecans evenly over the caramel sauce. Pour the chocolate mixture over the top of the caramel layer as evenly as possible. Put the pan in the refrigerator while you make the batter. Combine the cornstarch, sea salt and white sugar together in a small bowl. In a medium mixing bowl beat the room temperature cream cheese for 10 seconds. Add half the sugar mixture into the cream cheese and beat on low speed for 20 seconds. Then add in the rest of the sugar mixture and beat just until incorporated, about 20 seconds. Add in the sour cream and the vanilla. Beat on low speed just until incorporated for about 20 seconds. Add in the eggs, one at a time, and use low speed to mix just until incorporated. Use a rubber scraper to fold the batter and scrape down the sides. Take your pan out of the refrigerator and scrape the batter into the pan. Tap the pan up and down on the counter to let any air bubbles rise to the surface. If any bubbles arise, pop them with a toothpick. Then use a knife to smooth the surface of the cake. 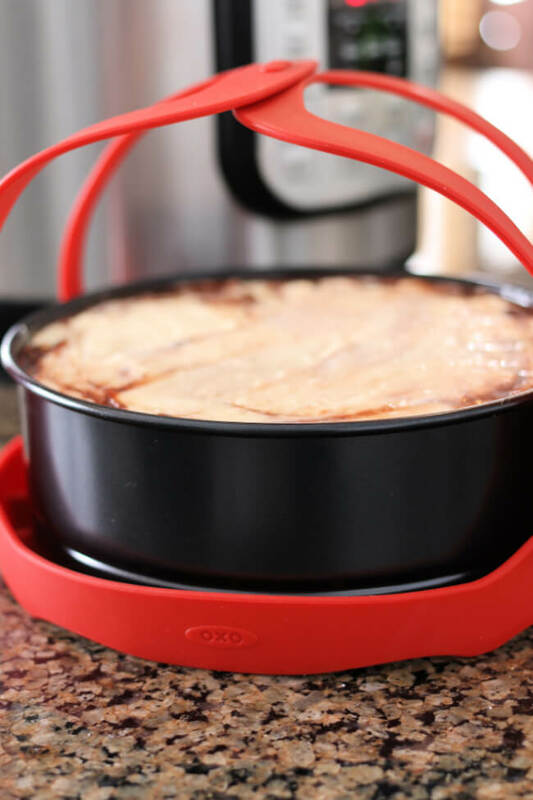 Place your cheesecake pan on the top of your OXO Silicone Sling. In your 6 or 8 quart pressure cooker heat 1 cup of water using the sauté function until it is boiling. Once the water boils, lower the sling with the pan on top into your pressure cooker. Turn off the sauté setting. Then cover the pot and secure the lid. Make sure the valve is set to sealing. Set the manual/pressure cook button to 28 minutes on high pressure. Let the pressure release naturally (usually around 10 minutes). Carefully remove the lid so that the condensation doesn’t drip onto the top of your cake. Use your sling to remove the cake and set it on the counter. Use a napkin to blot the top of the cake of any condensation drips. Let the cake cool on the counter for about an hour, or until the cake is at room temperature. Move the cake to the refrigerator and let it chill for 8-24 hours. Unlatch the pan and carefully run a knife around any edges that are sticking. Remove the side of the pan. Then carefully use a large flat spatula to remove the cake from the bottom of the pan/parchment paper. Transfer the pan to a wire rack with a cookie sheet underneath to decorate. Make the chocolate drizzle. Put the chocolate chips in a bowl. Heat the heavy cream just until it begins to boil, then pour over the chocolate chips. Allow to sit for 2-3 minutes and then whisk the mixture until smooth. 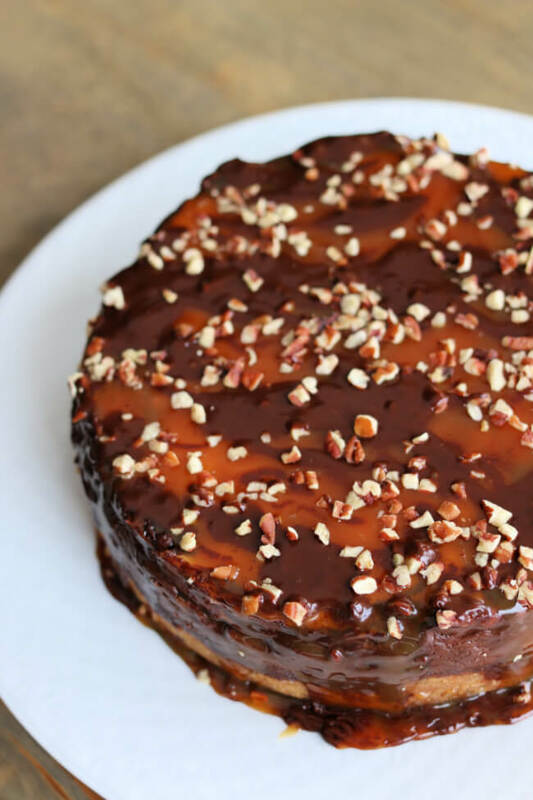 Drizzle the chocolate and caramel over the top of the cake and then sprinkle with pecans. Move the cake to a decorative plate. Slice with a serrated knife that has been under running hot water. Serve and enjoy. Have you guys tried any of OXO’s Pressure Cooker Accessories??? They’re game changers! Thx again Karen for another recipe. I luv cheesecake & going to try this right now as I have all the makings. I’ll let you know my results tomorrow. Where do you find the OXO’s Pressure Cooker Accessories? You can buy them on amazon! I’ve also heard Kohls. Excellent!! I was looking for a true textured New York style cheesecake for Valentine’s Day and this fit the bill perfectly! I really appreciated the tip about not over mixing, I think that got me the dense fudgelike texture I really wanted in a cheesecake. Truly a triumph, this was spot on. I think this was well thought out and carefully recorded to get optimal results. Thank you for your care and attention to detail, it was superb. 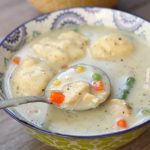 Can this be made in a slow cooker, this looks to good not to try. I haven’t tried this yet in the slow cooker! I need to though. I bet it would be done if you have a pan that will fit in your slow cooker. Love your site! Would this OXO silicone sling fit in an 8 quart Instant pot? I notice that most recipes are for 6 quart. Yes it works great for the 6 quart and the 8 quart!